You can customize which widgets you see on your dashboard and in what order you want them to appear. Alerts notify you of items you may need to tend to, such as gifts that need to be acknowledged and possible duplicate records. By going to the My Profile area in LGL, administrator-level users can manage which alerts appear on the dashboard and which will send email notifications. The Calendar displays activities occurring by day, such as gifts received, installments that are due, tasks that are due, and events. You can filter the calendar to show activities "owned" by team member. Donor Retention gives you a snapshot of your first-time donors, consecutive donors, and recaptured donors (donors who made a gift this fiscal year and at some point in the past, but did not donate in the previous fiscal year). 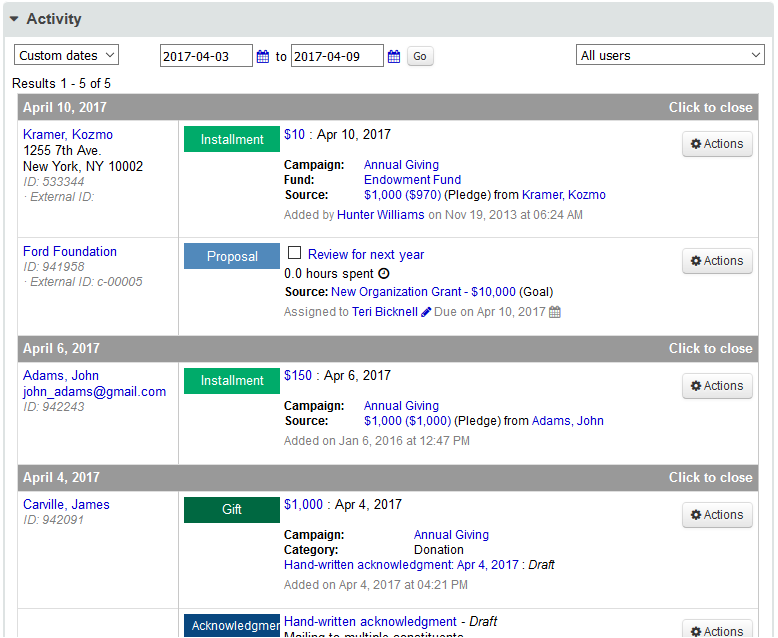 You can also toggle to the last fiscal year. 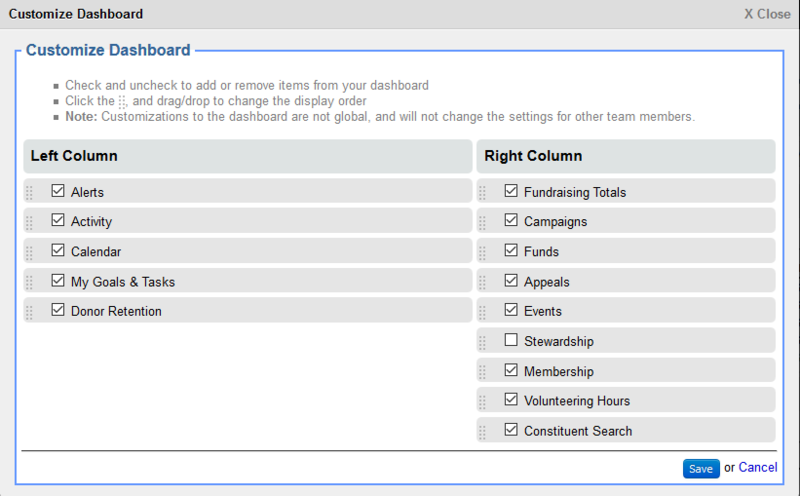 Click on the numbers in blue to see the list of constituents, and you can also view the search criteria that is used. 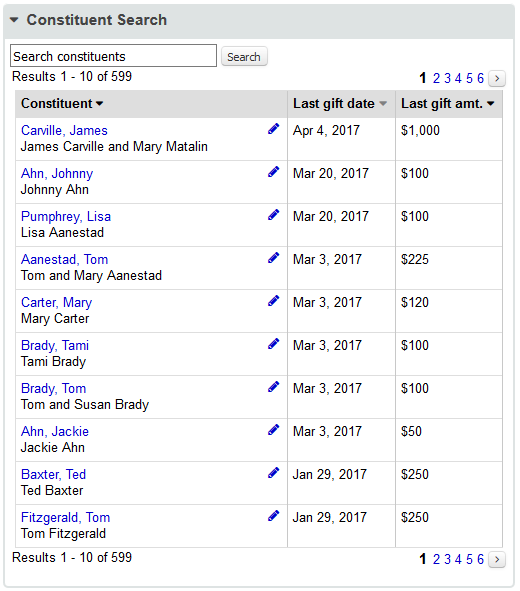 Constituent Search allows you to conveniently search for a particular constituent and also lists the constituents who gave the 10 most recent gifts. 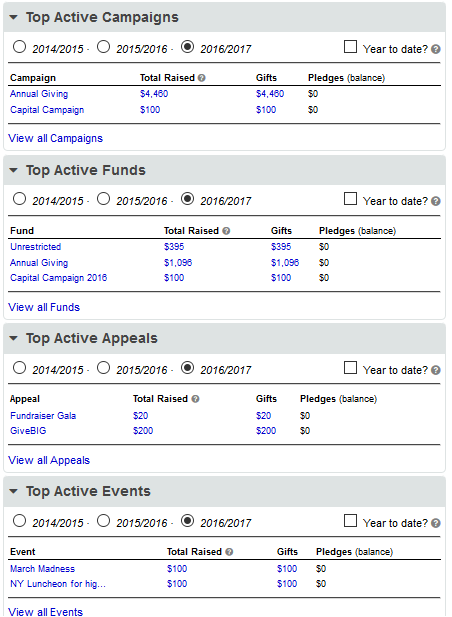 The Stewardship widget is a handy way to keep track of your donors, as it displays the number of Top 100 donors who have not yet made a gift this fiscal year, LYBUNTs (all donors who gave last year but unfortunately not this year), and more. 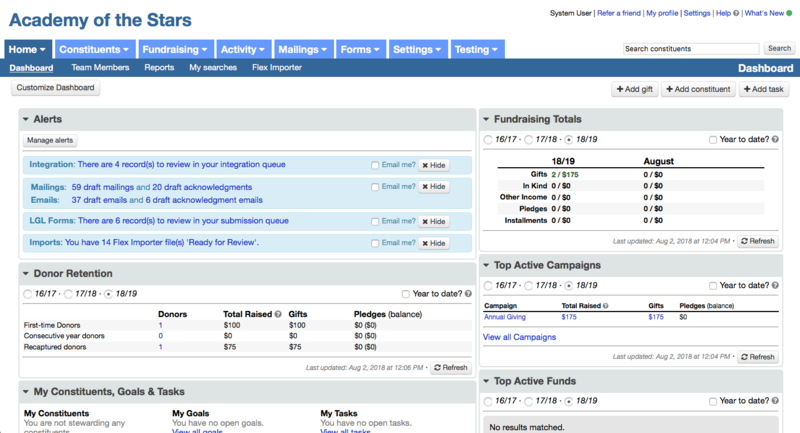 Click on the numbers in blue to view the donors who fall into these categories. You can adjust your view by selecting a particular steward from the dropdown menu.